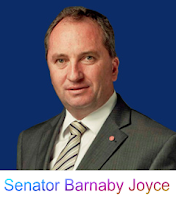 Werner's Cairns blog: Senator Barnaby Joyce describes the Australian federal government in one word. Senator Barnaby Joyce describes the Australian federal government in one word. In his press release Barnaby states that the federal Labor government is “dodgy.” Do you agree with that? Now let us analyse the word “dodgy.” It means: 1. Of uncertain outcome; especially fraught with risk. 2. Marked by skill in deception. 3. Of doubtful quality or legality. I heard in the radio that the National Tally Room in Canberra was booked today and that could mean only one thing that we will have an August federal election. Julia Gillard, our unelected Prime Minister, who was co-author of all the many disastrous schemes of the Rudd government, some with deadly consequences wants us to believe that things will be different now. Don’t believe it - leopards never change their spots. The Labor Government is dodgy! In trying to think of a metaphor to describe the Labor government in one word, it is this - dodgy! Their figures are dodgy when they talk about a $7.5 billion reduction in revenue but apparently only causing a $1.5 billion reduction in income. Their approach is dodgy when they talk about net debt as if the people who lent us the money don’t want the money back in gross terms and just for the record, we currently owe $150 billion and are currently borrowing an extra $150 million a day. They are completely dodgy with how they change Prime Ministers in the middle of the night without telling the Australian people. They are even dodgy amongst themselves with the deals they make, such as the one between Kevin Rudd and Julia Gillard on the process of leadership transition which Julia obviously didn’t honour because the backroom boys told her not to. They are dodgy in how they talk about future surpluses, yet their past prescriptions about current surpluses have been so totally wrong and actually end up as deficits. They are dodgy in how they describe solutions for the processing of boat people in East Timor when they haven’t actually done the homework to get the deal through East Timor. They are dodgy in how they employ mates such as Mr Kaiser for $450,000 a year without even putting an advertisement in the paper so that other Australian’s can apply for the job. They are dodgy in how they go forward with a $43 billion capital infrastructure program such as the NBN without doing a cost benefit analysis as to whether it will actually work. They were dodgy in the way that they allowed the importation of beef from countries with Mad Cow Disease until we found out about the deal and then they changed the decision around again. They were dodgy in how they told people that the ETS was the greatest moral challenge of our time, but the person who was crucial in changing that moral paradigm is now enjoying the benefits of the Prime Minsters office. They were dodgy when they inferred that an ETS would change the climate when quite obviously it was never going to. They were dodgy with how they told the Australian people that they would fix the hospital system by July 2009 or they would take it over and in the end, they did neither. They were dodgy when they decided to build school halls across our nation for $16.2 billion whether you wanted them or not and at three times the price. They were dodgy when they decided to put ceiling insulation into roofs and burnt down over 180 houses causing tragically the deaths of 4 people that we know of. However, where they are really dodgy is this – they told people that they would assist with the cost of living. They had the dodgy fuel watch scheme and the dodgy grocery watch scheme which were announced with fan fare but achieved zip. The cost of living in Australia is going through the roof because this crowd in government is dodgy and has absolutely no idea how to get the basics right. You cannot keep borrowing money at the rate they are, putting upward pressure on interest rates, and squeezing the last drop of blood out of working families and then claim to know something about the cost of living. You cannot talk about reducing coal fired power replacing it with renewables at many times the cost and not expect that this is going to make working families poorer. You can’t fail to develop the inland and not expect the result to be far greater pressure on the social and economic infrastructure of urban Australia. If you don’t develop water infrastructure then you have to expect the price of a limited resource, water, to go through the roof. If you keep on making it difficult for farmers to farm, with continual new laws on vegetation, and everything they do from sunrise to sundown and in between, while at the same time failing to oversee that farmers are getting a fair price at the farm gate, then the farmers will disappear and the price of food will go through the roof. You can’t borrow hundreds of billions of dollars from overseas and not expect that it has to be repaid by people who have to pay taxes, working families, who could have otherwise put that money in their pockets. In summary, many people at the supermarkets and at the pubs and clubs and at the church on the weekend and at the sport with their kids understand one thing - that they seem to be poorer under this crowd then they were before, they have less money than they did before. They seem to be watching a political soap opera that has more episodes than Blue Hills standing in proxy for decent government. If you are stressed out after reading this, here is something to cheer you up a bit. - Click here. We need more politicians like Barnaby Joyce, who aren't afraid to tell it as they see it. And in this case, he is absolutely correct in his summation. I was really surprised to read that the Australian government was portrayed as being “dodgy,” I thought that was a trait reserved for the USA national government only. Senator Barnaby Joyce is certainly not “dodgy” he calls a spade a spade. He is a real representative of the people of Queensland. What a pity we haven’t got a few more like him in the Senate or Parliament. With the election called, I’m prompted to tell you about the FALSITY OF CHANGE - RUDD/GILLARD and Oz politics. There's an old sea story about a ship's Captain who inspected his sailors, and afterward told the first mate that his men smelled bad. The Captain suggested perhaps it would help if the sailors would change underwear occasionally. The first mate responded, "Aye, aye sir, I'll see to it immediately!" The first mate went straight to the sailors berth deck and announced, "The Captain thinks you guys smell bad and wants you to change your underwear." He continued, "Pittman, you change with Jones, McCarthy, you change with Witkowski, and Brown, you change with Schultz. Now GET TO IT!" THE MORAL OF THE STORY IS: Someone may come along and promise "Change", but don't count on things smelling any better. Crikey, Harry’s logical explanation of “CHANGE” makes it easy to understand the meaning and is absolutely relevant to the present federal government. The Watermelon is a Nutritional Powerhouse!